Precise measurements of air ions in indoor areas, function rooms, production areas and vehicles are becoming ever more vital. 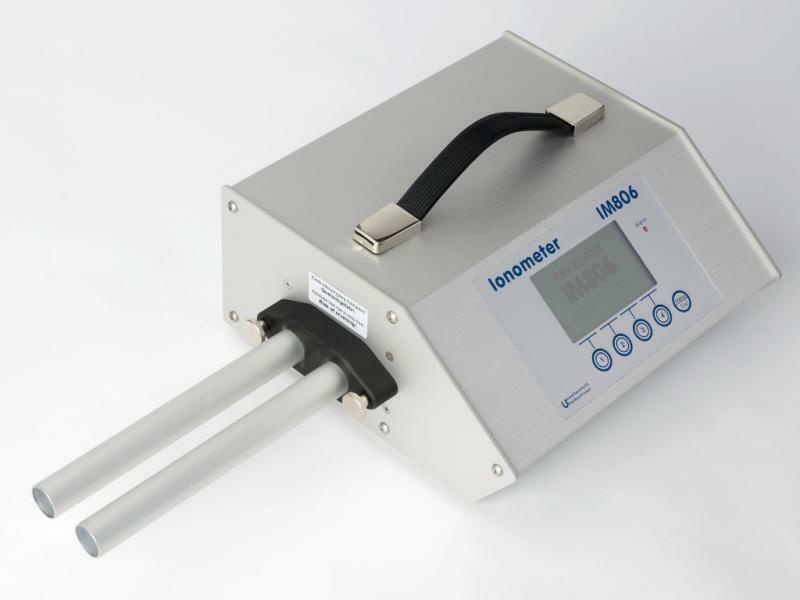 Due to their low electrical charge, air ions demand high technical requirements of the ionometer, which is the measurement device used to measure the ion concentration. 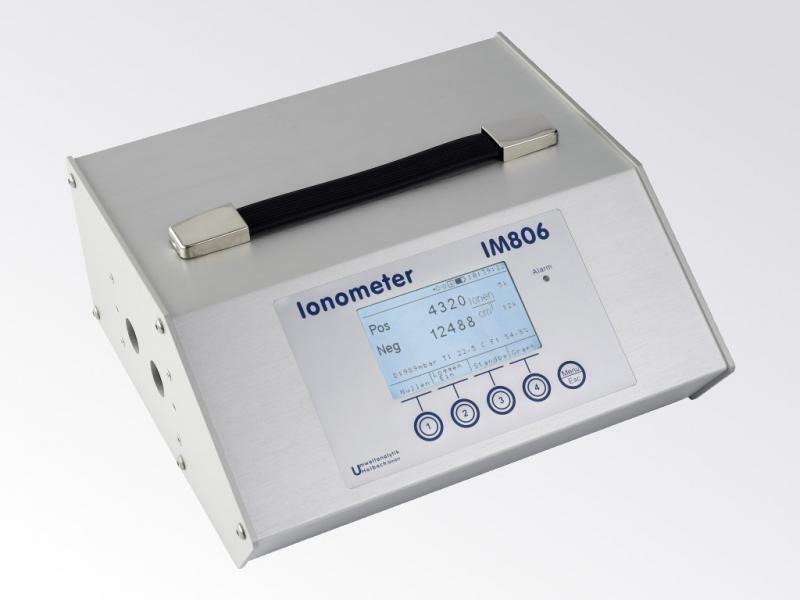 The ionometer IM806V2 – the successor of the IM806 – features two measurement channels for simultaneous measurement of air ions with positive and negative electrical charges. 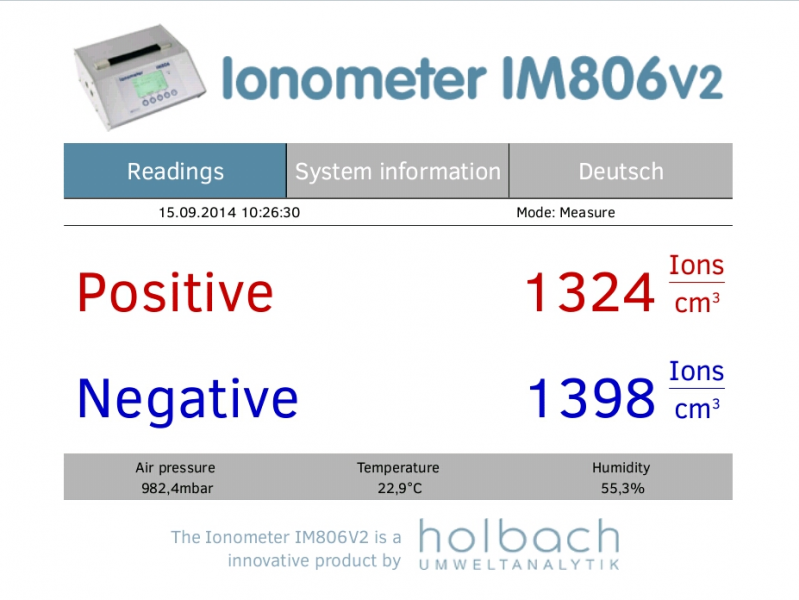 The ionometer IM806V2 is no longer available. The following model IM806 version 3 with color display and touch operation is expected to be available from November 2019. 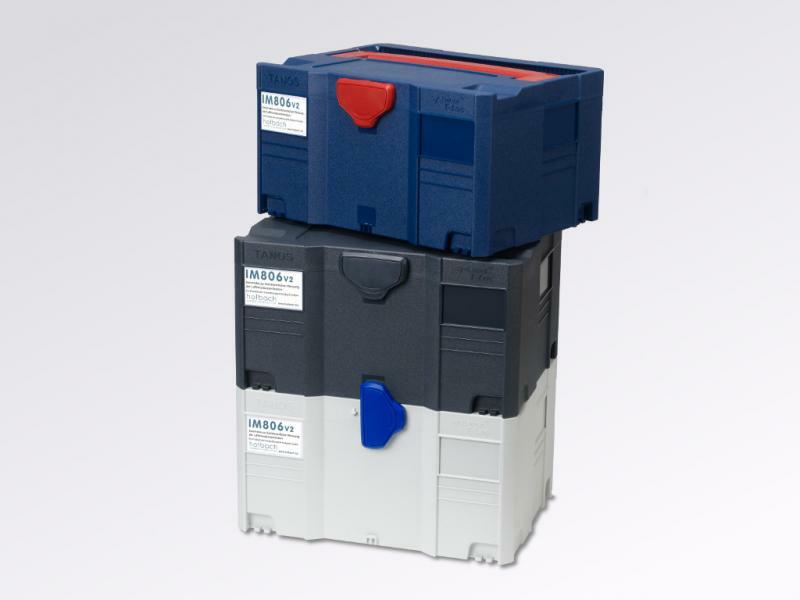 The measuring system consists of two outer electrode tubes (1 & 2), each of which holds a centric and electrically insulated smaller electrode. A DC potential is applied between the outer and inner electrodes, thus generating a DC electric field between the electrodes. The fan (4) continuously draws air at a defined flow rate through both of the electrode tubes. The DC electric field exerts a force in the vicinity of the electrodes on the ions in the streaming airflow (Coulomb’s law) and deflects them to the inner electrodes. Since the polarities of the applied voltage differ in both electrodes, one electrode accelerates the positively charged ions and the other electrode the negatively charged ions to the inner electrode. The air flow velocity, the level of the deflection voltage and the geometry of the electrodes are dimensioned such that ions of a defined ion mobility reach the inner electrode. Air ions of lower ion mobility (medium and large ions) only partially reach the inner electrode. At very high ohmic resistances (R) (up to 1011 ohm), the charge current flowing during the charge neutralisation generates a measurable drop in voltage, which is boosted using suitable measuring amplifiers (3) to a measurable signal proportional to the air ion concentration and then digitalised in the pre-amplifier (6). The entire sequence of operations is controlled using a microcontroller (5) which also handles the display, the storage logic, the analog outputs (7), the USB interface, the network interface and the climate sensors. The IM806V2 has an integrated barometric pressure sensor. 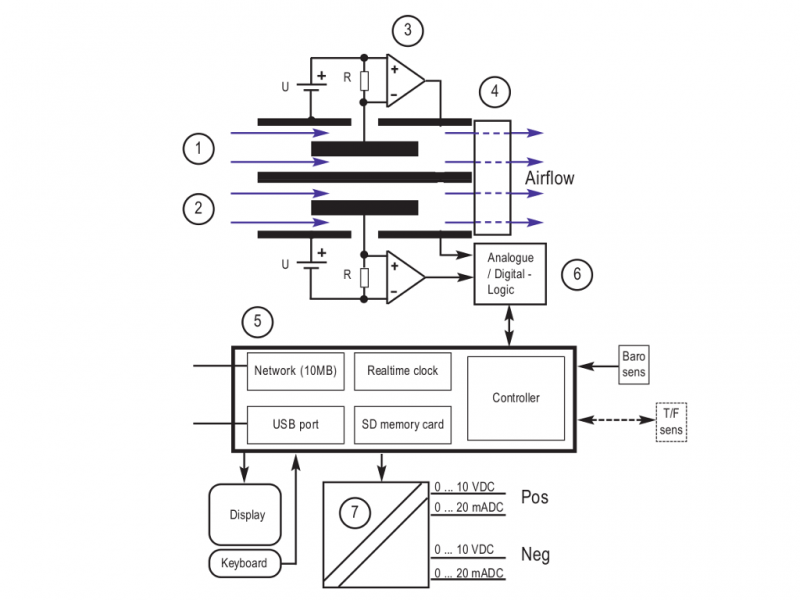 A temperature and humidity sensor (T/H sens) is also optionally available for recording the air temperature and relative humidity. Climate data also gets recorded. Using the PC software (for Windows XP and newer) included in delivery, the IM806V2 can be configured and remotely controlled. 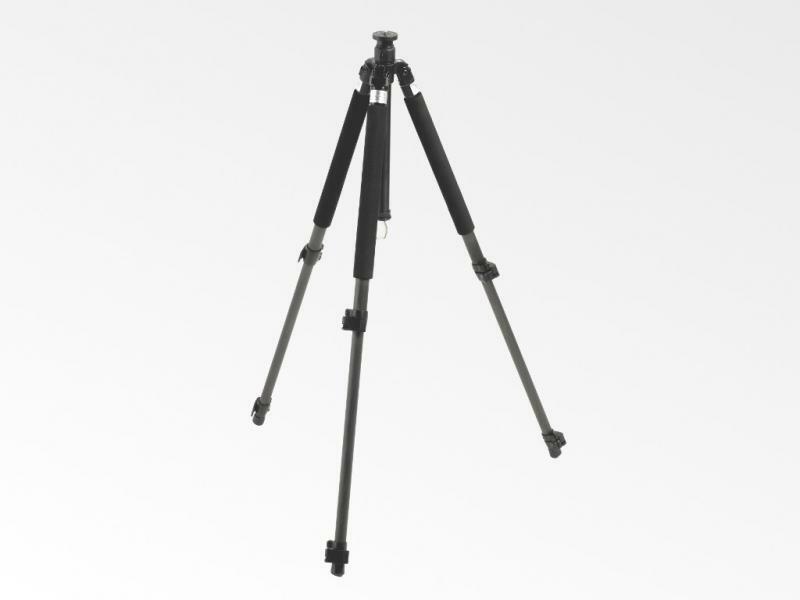 The software is also compatible to the previous model IM806. The stored data can be graphically displayed in a text file for additional processing or exported directly into an editable EXCEL template. The automatic macro call after the transfer of data allows customer-specific processing and graphical display of measured values. 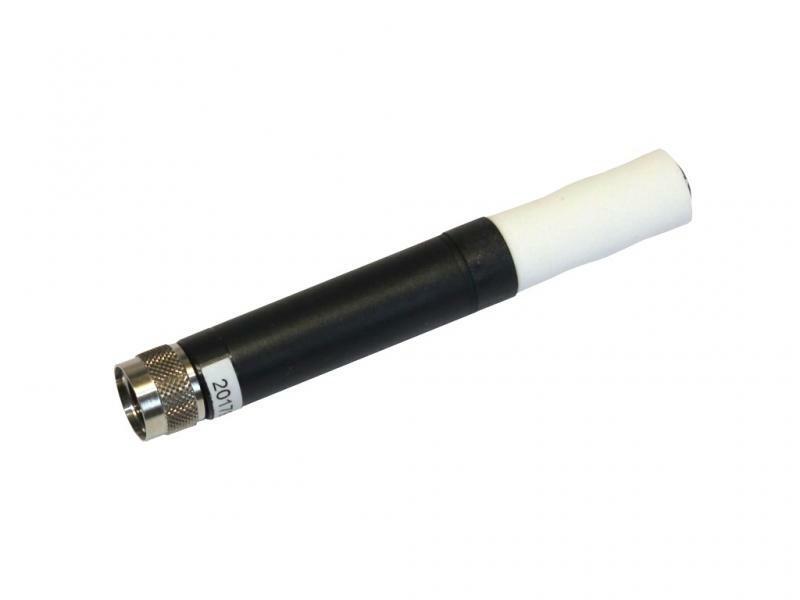 For direct measurement at sources and to avoid collision turbulence in air streams, the extension tube is optionally available. The extension tube unit is simply screwed onto the ionometer IM806V2. Via the screws, the extension tube is electrically connected to the housing potential. In addition, suction nozzles can also be installed on the extension tube for adjustment of the volume flow during measurement in external flows. The suction nozzles are calculated and manufactured based the customer's specifications. Using the network interface, the current measurement values and the current configration can be shown over the network in a web browser. 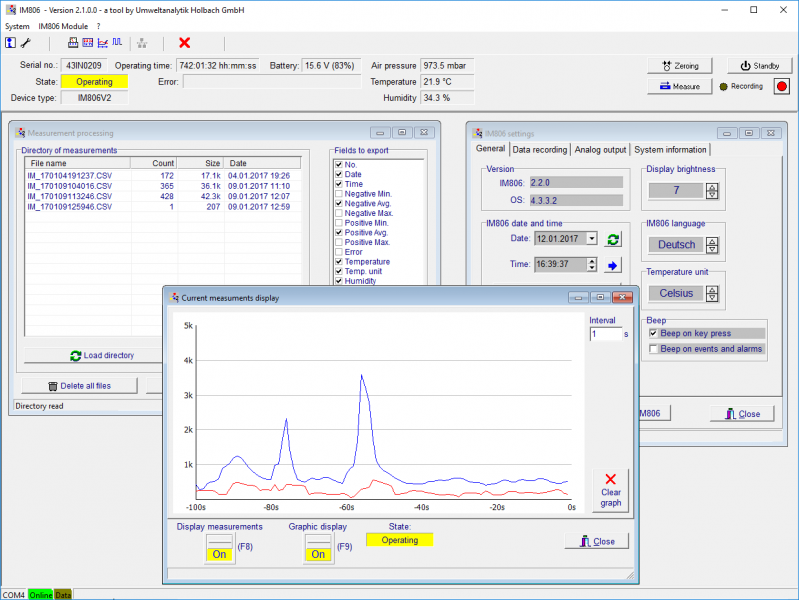 Additionally, the integrated FTP server allows convenient and fast access to recorded measurements.